Insect bites are more common in the summer months, when people wear less clothing and enjoy working or relaxing in backyards and sports like hunting or fishing. Bites from insects that leave stingers behind require proper treatment to avoid infections or complications. Learn the signs of an allergic reaction to these bites and when to call 911 for emergency medical help. Swelling is common after being stung by a wasp. 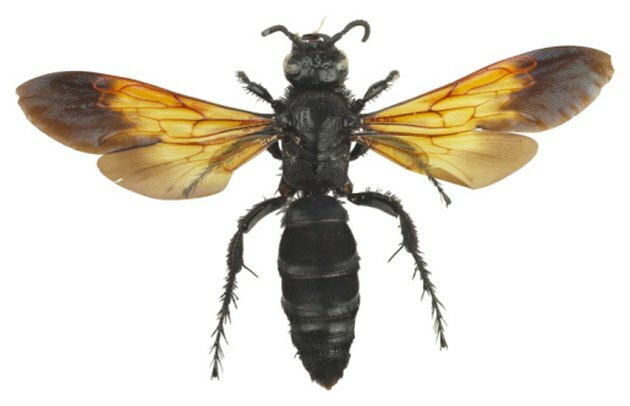 Not all insects with stingers leave them behind after they bite you. Bumble bees, wasps, hornets and yellow jackets all inject their venom into your body with stingers, but only honey bees leave the stinger embedded in your flesh. Attached to these stingers are poison sacs. They continue to send venom into your skin after the bee has been killed or left the site. A stinging sensation, redness and swelling are common reactions to a bite. These symptoms usually stop after 20 to 30 minutes. Once the bee has gone, locate the stinger. The quicker stingers are removed, the less venom enters your body. If you use tweezers to remove it, don't squeeze it or you will push more venom into your skin. Remove it by grasping the stinger firmly in the middle, not at the top. Use a sharp-edged tool or blade to hook the stinger and gently pull it out of the skin. Do not press downwards during removal. This will cut the stinger off, leaving some parts still embedded in your skin. A foreign object such as a stinger entering your body can cause an infection. Infections from honey bee stings are common. Signs the wound has become infected are increasing pain and sensitivity to pressure at the site of the sting, red streaks radiating from the location and a raised, red and swollen area around the bite. Generalized symptoms include fever and headaches. Inflamed, enlarged or tender lumps in the nearest armpit or the groin area also indicate your bite is infected. Seek professional medical help for these symptoms. Those with a minor allergy to bees feel the initial sting and see redness in the bite area. The next day, and up to five days after the bite, they experience less serious symptoms like red, hot skin and an itchy, swollen patch around the bite location. More serious allergies cause symptoms, such as swelling in parts of the body with no bites, breathing difficulties, generalized itching, throbbing headaches and faintness or dizziness. To aid anyone with a severe allergy to bee stings, call the emergency services immediately after the bite has occurred, or instruct a trusted person to call ahead of your arrival, if you are transporting the victim. Cold compresses over the bite location and lowering bitten parts below the heart level slow the spread of venom in the body. Call 911 immediately for bite victims who turn pale, experience breathing difficulties or become mentally confused. They may be entering a state of shock.